1Q: Tell us a little about the origins of When I’m With You, from concept to financing. DANIEL: For me as the director I came into the process of creating When I’m With You when Adrienne Lovette sent me a script and invited me to a reading of one of the drafts she had written. It was great for me because I was able to hear the entire script out loud and visualize the film in my head. After that we kind of discussed what the look and feel of the film would be. I approached my good friend Ryan Balas who’s a very talented director and cinematographer and asked him if he would jump on board as DP. He had previously DP’d a film I directed a year ago (What It Was) and thought he would be interested in this story… which he was! The shooting process was very quick and Adrienne was very good about making sure everything came together efficiently. I enjoyed working with Adrienne. I’ve admired her as an artist for years and am very fortunate to have her as a friend and see her bring her first film to life. 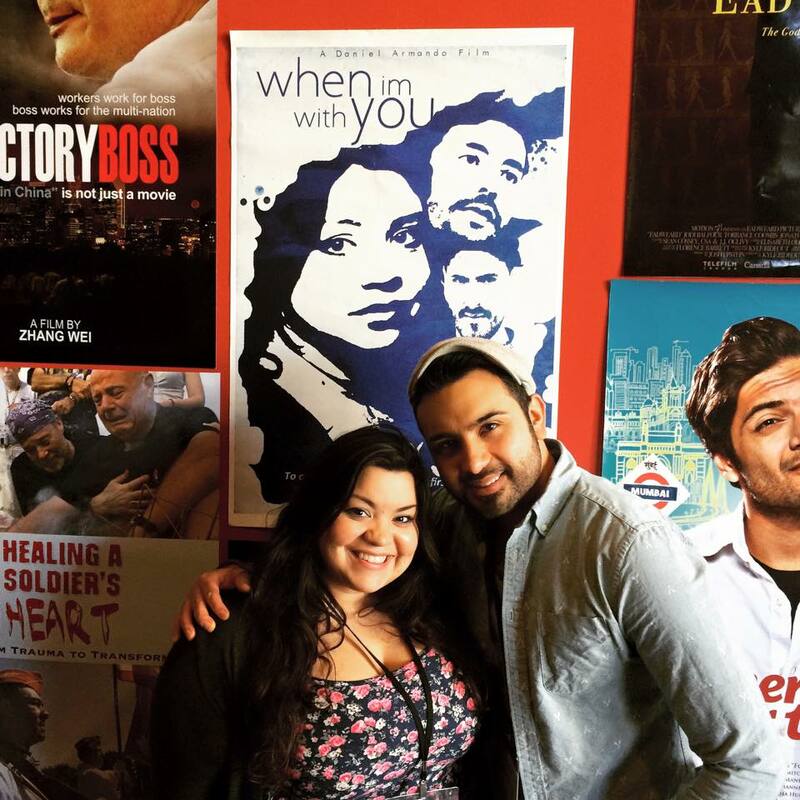 2Q: Cinequest Film Festival is hosting the World Premiere of When I’m With You. Explain to us how it feels to bring this film before audiences for the first time, and what do you think their reaction will be to your film? ADRIENNE: Well, we have one more screening on Thursday March 5th at 2pm so make sure to check out! It’s a surreal experience because you just never know if your film could make it into a festival as big as Cinequest. We were very nervous because we weren’t sure how the film would be received and just hoped we did our job in conveying the message we wanted to convey. Since our first screening we have experienced audience’s reactions to the film and have been getting some incredible responses from the patrons that have seen it. One gentleman let us know that we succeeding in making an ‘uncomfortable subject’ for him comfortable to watch, and he didn’t feel the urge to leave at any moment because he related to the characters and their situations. We succeeded in educating him on the LGBT community, the human condition and how everyone is searching for acceptance and love. We are extremely proud of that, and hope it continues on in more festivals! 3Q: What was your best and/or worst experience while making When I’m With You? DANIEL: It was an awesome experiencing making this film. Adrienne loves working with her friends so for all of us we knew how important this was for her and we just wanted to help her make this beautiful story she created a reality. Of course making a film on a shoe string budget can be a challenge and it makes way for some creative thinking on how to make things happen, but for everyone on set, creating is our passion and making movies is what we do. So we welcome the challenges. ADRIENNE: WHEN I’M WITH YOU is a film that talks about acceptance, love, heartbreak and relationships. Each character has their own struggle, and some of the characters happen to be gay, but you can still relate to their situations. Many people can relate to being in love with someone that’s not in love with you, many people can relate to losing a family member you love dearly, and everyone can relate to regret and fear. It’s about people, and people searching for a family. People are afraid to say I love you, and these characters struggle with that, but what kind of world would it be if we let each other know? That’s why people should see this film, because it might inspire you to say the three words that can create such a positive change. 5Q: Time to pre-plan: You just won the Oscar for When I’m With You. Give us your acceptance speech. ADRIENNE: Oh boy! Wouldn’t that be a dream come true! I guess I would first and for most thank my husband, mother and sister for being such strong and supportive people in my life. They are the reason why I am able to follow my dreams and I wouldn’t have been able to do it without them. I would thank my amazing cast and crew who put so much of there heart and soul in this film! I would thank my composer Sean Balas for the beautiful music and all of the singers/musicians like Michelle Armstrong, Matt Cusson, Chuck B. , Mikey Hynes, and Richard A. John Jr. for donating their talents to the film! The incredible visual artists like Lydia Pfeffer and my best friend Sean Baumgardner. And last but not least I would thank John Rice (KARL/Script Editor) for his wisdom and guidance, my incredible Director of photography for capturing the beauty of each character, and my extremely talented director Daniel Armando for his direction, support and unremarkable vision and for always believing in me and encouraging me that I could do it. There would be too many people to thank quite honestly, so I would probably get cut off by the music…and refuse to leave until I finished. See WHEN I’M WITH YOU at Cinequest!